This post expands on an article I wrote — ‘Petit Verdot Comes of Age in the Piedmont’ — published in the current issue (November/December 2017) of Piedmont Virginian magazine. Though the article focuses on the growing prominence of Petit Verdot as a varietal wine in the Piedmont region, the grape is thriving in vineyards throughout Virginia and Maryland. 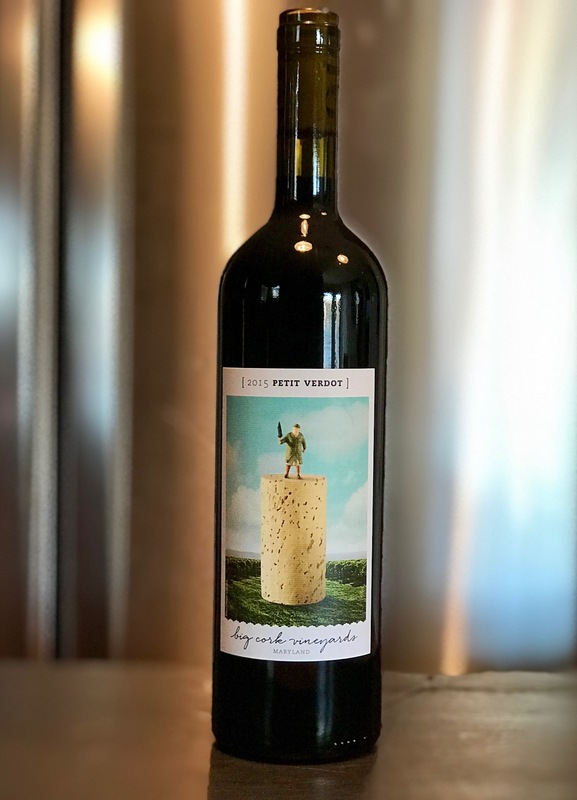 Best known as a minor blending grape in Bordeaux to add color and structure to left bank red blends, Petit Verdot has found a home in the Mid-Atlantic as a stand-alone variety. The exact origins of Petit Verdot (translates to the little green one) are unclear but it’s widely thought to be a cross between Duras and Tressot and one of the first grapes planted in Bordeaux, likely by Romans. 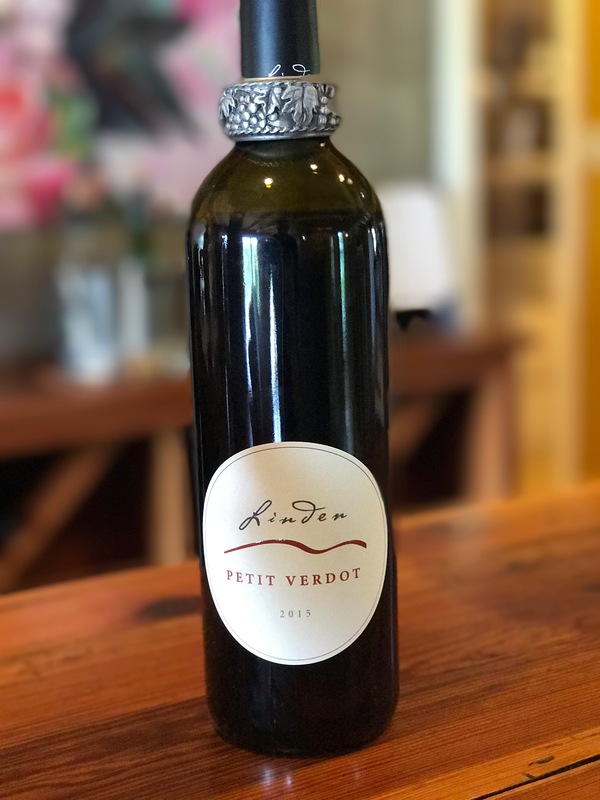 Dr. Tony Wolf, Professor of Viticulture at Virginia Tech, Jim Law of Linden Vineyards, and Dennis Horton, founder of Horton Vineyards, were among the first to plant Petit Verdot in Virginia. Law also planted Petit Verdot in his Hardscrabble vineyard at Linden 1991 with similar results. “I immediately became enamored with the vines as they were more or less problem free and consistent in yields. Once it became evident that there was a bright future for Petit Verdot in our region we planted a lot more,” wrote Law in his vineyard journal. As Petit Verdot proved its potential in early plantings — cold hardy and ripened consistently in the vineyard and offered big flavors, color, and structure in the cellar — more growers in the Mid-Atlantic region devoted vineyard space to the promising grape. 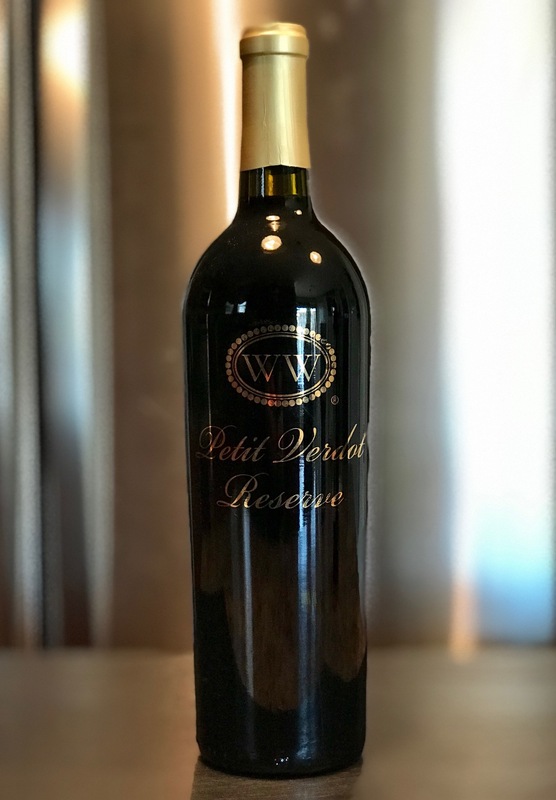 In 1998, the Woodward family planted their first block of Petit Verdot at Jefferson Vineyards, followed by additional plantings in 2003 and 2010. The 2014 Jefferson Vineyards Petit Verdot was one of five 2014 Petit Verdots that garnered one of 12 coveted top spots in the 2017 Virginia Governor’s Cup Case (along with King Family Vineyards, Ingleside Vineyards, Valley Road Vineyards, and Veritas Vineyards). In 1999, Doug Flemer, owner of Ingleside Vineyards, planted four acres of Petit Verdot at his estate vineyard on the Northern Neck of Virginia. In 2005, Winemaker Matthew Meyer planted nearly four acres (2,805 vines) of Petit Verdot at the Williamsburg Winery estate vineyard at Wessex Hundred in Williamsburg, VA. While Petit Verdot seems to show it’s best when cultivated in well-draining gravel soils, the grape is performing well across the state: from the clay soils of the Monticello region to the granite soils north and west to the sandy loam soils of the Northern Neck and Tidewater area. Winemaker Andy Reagan, who was recently named winemaker at Horton Vineyards in Gordonsville, first worked with Petit Verdot in 2002 while at Chrysalis Vineyards in Middleburg and during his seven years at Jefferson Vineyards. Today, there are 205 bearing acres of Petit Verdot planted in vineyards throughout the state with another 50 non-bearing acres. This is a significant increase from the 80 acres planted in the state a decade ago (the first year Petit Verdot acreage was reported in the Virginia commercial grape report). Dave Collins, winemaker and co-founder of Big Cork Vineyards in Rohrersville, MD, about 70 miles northwest of Washington, DC, has worked with Petit Verdot for nearly 20 years in Virginia and Maryland. Local wine enthusiasts may remember Collins for his 14 vintages at Breaux Vineyards in Purcellville in Loudoun County. Collins left Breaux in 2011 to establish Big Cork Vineyards and today farms about four acres of Petit Verdot (of the 35-acres under vine). “Growing Petit Verdot presents one of the greatest challenges as well as the greatest rewards of any of the red varietals that I’ve worked with,” said Collins. Given the inconsistent weather in Virginia and Maryland — spring frosts and hailstorms, intense humidity, autumn rains — consistency in the vineyard and winery is critical to winegrowers. Varietal Petit Verdot provides local winemakers an opportunity for differentiation in the crowded wine marketplace. Linden, VA. Fauquier County region. A blend of 97% Petit Verdot and 3% Carmenere, 85% of the grapes are from Jim Law’s estate vineyard, Hardscrabble, one of the earliest plantings in Virginia (vines range from 15 – 25 years old). The remaining 15% is from Richard Boisseau’s Vineyard (10%) in Warren County and the remaining 5% is from Shari Avenius’s vineyard. Dark purple in color; intensely aromatic; smoky; aromas of dark cherry, plum, spice jump from the glass, followed by earth and hints of leather. Flavors of dried strawberry, game meat and spice, with nice mineral acidity. Lengthy dark fruit finish. Calls for grilled red meat. Will be exceptional in three to five years. 330 cases produced. Another exceptional wine from winemaker Damien Blanchon. As much as any winery in the region, wine quality at Afton Mountain has improved considerably in recent years thanks to capital investment and drive to improve by owners Elizabeth and Tony Smith since purchasing the property in 2009. This wine is made from 100% estate-grown Petit Verdot from blocks planted in 2008 and 2012. Big and bold; earthy with loads of dark fruit and hints of dried herbs; grippy tannins; lengthy dark berry and spice finish. Suspect this is even better paired with grilled game meat. Williamsburg, VA. Hampton Roads region. Established in 1985 (purchased land in 1983) by the Duffeler family, The Williamsburg Winery is one of the pioneering wineries in the Commonwealth. Of the 40-acres under vine at the historic property, about 10% is dedicated to Petit Verdot. This 2015 is a blend of 87% Petit Verdot, 11% Malbec and 2% Cabernet Franc. The Petit Verdot was grown in the sandy loam soils of the estate vineyard at Wessex Hundred in Williamsburg while the Cab Franc and Malbec are from clay soils at Mount Juliet Farm in Crozet. The most concentrated of the recent tasting of seven Virginia and Maryland Petit Verdot wines. Deep ruby in color, this wine is dense, offering notes of stewed dark berries, figs, and hints of cocoa and sweet tobacco leaves; notable wood; violets and spice linger through the lengthy finish. Hefty tannins. Will be even better in a few years. Oak Grove, VA. Northern Neck region. Located on the historic Northern Neck, the Ingleside property has been in the Flemer family for more than 100 years. The original grape vines were planted in the sandy loam soils of the property 1980 and today is home to some of the oldest Petit Verdot vines in the state. A blend of 75% Petit Verdot, 15% Cabernet Sauvignon and 10% Cabernet Franc, this wine is inky purple in color, offering notes of dark cherry, dates, dried strawberry around a core of earth and spice. Lovely acidity and firm tannins while showing restraint and elegance. A delicious Petit Verdot. Made from 100% estate-grown fruit. Four of the 35-acres under vine at Big Cork Vineyards is planted to Petit Verdot. The quality of this 2015 and the previous vintage, make a strong case for planting more Petit Verdot. While varieties like Albarino are increasingly popular in the region, Petit Verdot (especially this one) shows the most promise in my opinion. Violet-black in color; this wine is big without going over the jammy edge. Beautiful aromatics; dark plums, blueberry jam, spice and hints of violets. Equally intense flavors in the mouth; loads of dark berry jam, fig, spice and tobacco leaf followed by a little earthiness. Lengthy dark berry finish, hefty tannins so decant before serving. Would be great with a hearty stew or cassoulet on a cold night or even with burgers on the grill on a warm evening. The quality of Collins’ wines, and Maryland Petit Verdot, continue to impress. And the latest Petit Verdot from DuCard Vineyards in Etlan.